Objectives: Dysmenorrhea is a frequent complaint in young females. In recent years, with regards to the side effects of chemical drugs, researchers have grown an interest in the use of herbal drugs to decrease the menstrual pain. 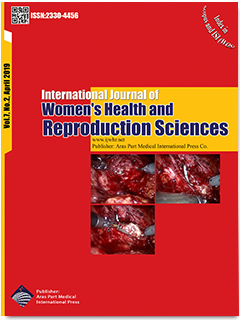 This project was conduced to evaluate the effect of valerian and ginger on the duration of pain and analgesic use in dysmenorrhea. Material and Methods: This triple blind randomized clinical trial was performed on 210 female dormitory- in 3 groups. The participant participated one of the three groups of valerian, ginger, or control after opening an envelope. In this study, the administered dose of ginger and valerian in each capsule was 250 and 350 mg respectively and 250 mg sugar was used as placebo. The number of days with pain and analgesic use were evaluated. Written Inform consent was signed from all of the students. In this study, descriptive statistics (percentage and mean) and inferential statistics ( T- test ,post hoc, and chi2 at a significance level of 0.5) were used. Results: The study showed a significant different in the duration of pain between ginger (1.61±0.64 days) and control groups (2.12±0.81 days) (p= 0.052) and between ginger (1.61±0.64 days) and valerian groups (2.53±1.43 days) (p=0. 001). The mean days of analgesic use among three groups was not different significantly (p>0.05). The mean severity of symptoms was significantly different between ginger (0.73±0.28) and control (0. 3±0.04) groups and increased in the ginger group (p=0.003). Conclusion: Administration of valerian and ginger at the doses used in this study does not produce desirable analgesic effects and does not decrease the symptoms associated with dysmenorrhea.